UPDATE – April 2, 2012: N-Trig have posted beta drivers for Windows 8, enabling single-touch, clickthrough and basic multitouch on the Dell Latitude XT under Windows 8 (Consumer Preview). The Windows 8 Previews install quite straightforwardly onto the Latitude XT, but does not include a driver for the XT’s integrated GPU; likewise, a driver is also not (yet?) available via Windows Update. As such, the display is noticeably slow to update and runs at a lower-than-native resolution. When loaded, the installer may not detect the integrated graphics card and so refuses to install the driver. In which case, the thing to do is start ‘Windows Explorer’, right-click ‘Computer’ and choose ‘Properties’ from the menu which appears. In the window which opens, choose ‘Device Manager’ (on the left) and then navigate to the Display adapter, which may appear as “Microsoft Basic Display Adapter”. Right-click on the adapter and choose ‘Update Driver Software’ from the menu which appears. In the window which opens, choose ‘Browse my computer for driver software’ and on the next page ‘Browse..’ to the folder into which the package downloaded from AMD extracted the driver. On my XT, this was C:\ATI\Support\10-02_legacy_vista32-64_dd_ccc\Packages\Drivers\Display. With the folder selected, and the ‘Include subfolders’ box ticked, click ‘Next’ and the driver should install. What about the touch? I m having some issues with my touch screen, it click automatically here n there.. But when i rebooted with windows 7 it works very good. and How about the Tablet Buttons? the display orientation button? did u try tht..? Unfortunately, the installer for the touchscreen drivers from N-trig specifically checks for Windows 7 and, when it doesn’t find it, refuses to install. I’ve tried extracting the driver files from the installer package and installing them manually, as with the graphics driver, but with no success (so far). As for the ‘Tablet Buttons’ (screen rotation, etc. ), the QuickSet package for Vista might work (as I think it did for Windows 7, previously), although I haven’t tried this, yet. Having extracted the files from the N-trig driver package (using Universal Extractor), I can confirm that running DPInst.exe will install the drivers for pen and touch, although I found that I had to execute DPInst.exe in both the ‘Disk1’ and the ‘Disk1\x32’ subdirectories before it would work at all. Once I’d done that, however, I found that press-and-hold of the stylus brings up the right-click menu, as expected. Also, the QuickSet package for Vista seems to enable the front-facing buttons on the display (switching the display orientation, etc.). The previous link referred to Dell’s website, from which the package seems no longer available, but it can be had on their FTP site. Glad to find this thread. Downloading display driver now. Also running W8 DP on Lat XT, dual booting with Windows 7. (Posting this reply using W8). Pen and touch seem to work right out of the box… the only issue I am having is that touch screen taps on the start screen (and inside W8 sample apps) do not seem to register as mouse clicks. The tiles do react as if being touched, and common drag gestures and multi-finger gestures seem to work correctly. A minor frustration that I can do anything EXCEPT for the most common simple click. Strangely, the on-screen touch keyboard DOES accept touch taps as key clicks. Dont have this issue whatsoever with the pen, but would really prefer to use fingers. I had the same problem with touch – tapping the screen did not register like mouse clicks – until I installed the drivers from N-Trig as described above. Woot! That certainly did the trick for me… didn’t even have to reboot. What a difference. I’ve tried installing the drivers from N-Trig and from Dell using the techniques described in the previous messages. The stylus works perfectly but the “touch” is quite messy. E.g., when I try to draw a straight line in Paint by moving my finger from left to right, the line goes up & down (+/- 2cm with regard to the correct position in the best case but sometimes +/- 10cm). I’ve tried to recalibrate the screen using the NTrig utility (that used to work when I had the problem on Windows 7) but it doesn’t work. I haven’t experienced the same issue. It may be that the N-Trig calibration utility relies on the drivers having been installed via the N-Trig installer before it will calibrate the touchscreen? What kind of hard drive, or I’m assuming SSD, are you using? It’s quite difficult to find a 1.8″ IDE SSD. 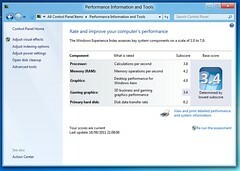 I found this though (http://www.activemp.com/SSD/18-IDE-PATA-ZIF-SSD-Z4.htm) and it looks promising. I’m using a RunCore Pro IV 1.8” PATA SSD. I think this is the product page: http://www.runcore.com/en/RC-SSDProductShow-65.html (although it doesn’t mention a ZiF connector). I’m trying to shoe-horn the 8 preview onto a Latitude ST Tablet but the 8 installation is prompting for a driver immediately – Any idea which driver it wants? I thought it might be the N-Trig but it wasn’t any of those. Suggestions? Sorry, I can’t be of much help here – I don’t have access to a Latitude ST. When prompting for the driver, does the Win8 installer give any other details? No, I haven’t come across that issue, but I’m not an especially heavy user of Windows 8. Have the n-trig working fine as well as ATI graphics BUT no luck at all getting those buttons to work to rotate screen NOR will the screen auto rotate. Quickset drivers just don’t do anything for me. I can’t get the ATI graphics to work in the Win 8 release… It says the existing drivers are the best ones when I try to browse out to the folder with the ATI driver. Unfortunately, I’m unable to help, here, as I don’t have access to either a Latitude XT or Windows 8 Release. I just got the quickset drivers from the top link above working. Once installed and after restart it is running. In the notification area you have to click the icon for quickset once. Then choose “enable tablet buttons”. I hope this works for you too. Although I”m glad this works now still not everything is perfect. I get a scrambled screen when I install and start the “good old” solitaire app. Can you reproduce this? And which version of the Ati driver are you using?